In November of 1842, Rev. Edward F. Sorin, C.S.C., and seven Congregation of Holy Cross brothers traveled nearly 300 miles on foot from Vincennes, Indiana, to South Bend to establish the University of Notre Dame. In August 2017, to commemorate the University’s 175th anniversary, the University will recreate Father Sorin’s journey on the Notre Dame Trail. This physically challenging excursion, during which participants will walk a similar path as the one Father Sorin and his companions traversed, will also be an opportunity for reflection, prayer and pilgrimage. Throughout the excursion from Aug. 13 to 26, participants will walk as a community, building in momentum and number as the travelers draw closer to campus. 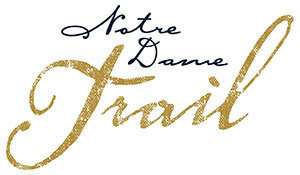 The Notre Dame Trail will conclude on Aug. 26 (Saturday) with a celebratory Mass on South Quad. For those who are not able to make the journey in person, there will be a number of ways to participate virtually. Registration for the Notre Dame Trail will begin in late October. More information is available on trail.nd.edu. Originally published by Sue Lister at news.nd.edu on October 04, 2016.